I feel like these are a must have for spring/summer. This color never seems to go out of style and it is becoming more and more of a neutral. Turquoise goes with almost anything and when combined with just jeans and a white button down – it can add that perfect pop of color. The above pair is by designer Siman Tu. I love these Chanel earrings that Rachel Zoe is wearing. They look amazing with her black cocktail dress and add some wow-factor to an otherwise boring dress. But of course, this is Rachel Zoe, so she knew what she was doing. 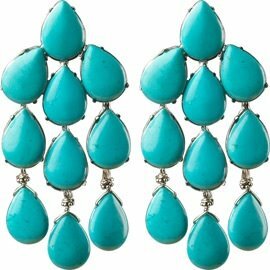 With turquoise, you can’t go wrong. It looks good on everyone – no matter what your skin tone or hair color… red, yellow, black or white – turquoise is color blind. This entry was posted in Design Inspiration, Hip and High End, Mollie and tagged chandeliers, coral, earrings, turquoise. Bookmark the permalink.